Georgian London, Summer 1763, a year in which, to quote Janet Ellis’s note, “nothing much happened”. 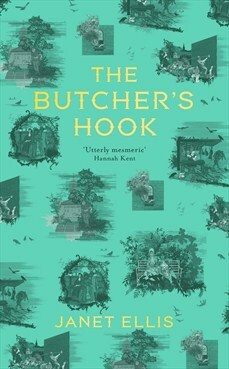 This means there is nothing to distract the protagonist of The Butcher’s Hook or her family from their seemingly ordinary, upper middle class lives. The Butcher’s Hook is a fairly macabre character study. Anne Jaccob, eldest daughter of the Jaccob family, bursts from the book from the first page. She appears contemporary but is also very much of her age. The way she and her family behave, though, is shaped by the mores and expectations of the time. Anne is a clever girl but is not sent to school, she has a tutor who leaves her father’s service under a cloud. Left to her own devices, Anne becomes a singular personality, finding it hard to make connections with other girls her age when the opportunity is presented and creating an intense inner life. Anne is a teenager and full of passion, unwilling to be shackled to the odious Onions, the man who her parents have chosen for her. Instead, she falls deeply for the butcher’s nephew and they begin a clandestine relationship. She then bucks against a system that forbids this relationship, going to extreme lengths to protect it. Despite the seeming hopelessness of her situation, once she starts to put her plans into motion it is hard to feel sympathy for Anne. But Ellis makes it easy to be fascinated with her. Living in a society that provides her with everything she needs, Anne becomes an arch manipulator. Being a teenager, though, she is not quite as smart as she thinks she is and her plans quickly spiral out of control. Anne’s London is lovingly described by Ellis and emerges in all of its mud and poverty from the page. A cast of Dickensian characters – the parson, the suitor Mr Onions, Anne’s tutor Professor Edwards and a series of anonymous urchins – are all interesting even if when seen through Anne’s jaundiced lens. Even Anne’s parents, who may have fallen into a standard Georgian mould, emerge with colour. The Butcher’s Hook is a strange amalgam. On the surface, much like other novels set in this milieu and in this era, it is about a middle-class family looking to make a good match for their daughter. However, Anne’s criminal exploits, and to an extent those of the people around her, give it more than a passing resemblance to more modern crime thrillers. This combination makes The Butcher’s Hook a blood-soaked history lesson – a coming of age with teeth.